The police have revealed the identities of 12 suspects who were arrested for alleged connection to the last Thursday’s robbery in Offa, Kwara State. Jimoh Moshood, the police spokesperson at Force Headquarters, released details of the arrests, including recovered exhibits, in a statement to newsmen around 6:00 p.m. Friday. These three (3) last suspects in whose possession another Beretta pistol and Fourteen (14) rounds of live ammunitions were recovered. Consequent on the Inspector General of Police, IGP Ibrahim K. Idris NPM, mni, deployment of high-powered Police Investigation Team, Armoured Personnel Carrier (APC), Three (3) units of Police Mobile Force (PMF) and Anti-Robbery equipment to Kwara State to carryout discreet investigation into the banks robbery, prevent further attacks and bring perpetrators to justice; the high-powered Police Investigation Team deployed in synergy with the State Criminal Intelligence and Investigation Department have arrested the Nine (9) above mentioned Armed Robbers directly involved in the Banks Robbery and attack on a Police Station in Offa, Kwara State. 2. The Police teams engaged in massive raids of identified criminal spots/flashpoints, stop and search operations, visibility and confidence building patrols, intelligence gathering which led to the arrest of the suspects. Some of the arrest also involved serious exchange of gun fire between the Police and the suspects in their various hideouts. 3. The following are the suspects arrested and have admitted to the various criminal roles they played in the banks robbery attacks and are also assisting Police investigation into the incident. i) Adegoke Shogo 29yrs Native of Offa Kwara State, he was arrested in Offa after the bank robbery and the attack on the Police Station. He is drug baron and also an Indian Hemp dealer in Offa Kwara State. According to intelligence gathered from cultivated and reliable informant, he is alleged to be one of the sponsors of the robbery attack and the Police Station in Offa. He has made useful statements to the roles he played in the armed robbery. ii) Kayode Opadokun 35yrs Native of Offa Kwara State, He was found out to have been released from Prison Three (3) months ago after Serving only 8months of his sentence years for Armed Robbery, Notorious Armed Robber and confirmed Gang member of the Offa Bank Robbers. A Barrette pistol and six (6) rounds of live ammunition was recovered from him. 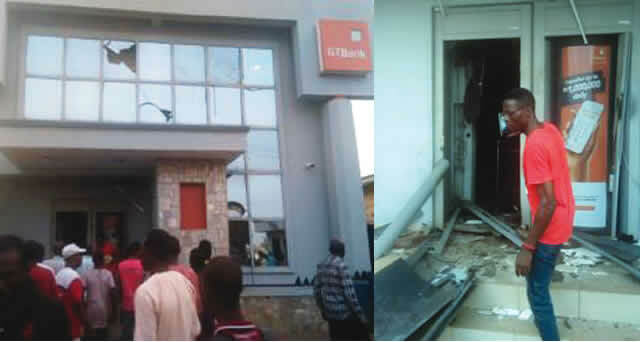 He has admitted to the criminal roles he played in the Offa Banks robbery. iv) Azeez Abdullahi 27yrs Native of Offa Kwara State, Gang member from whom a Victim’s Phone and SIM Cards were recovered. v) Alexaner Reuben 39yrs Native of Isoko LGA Delta state, He is a Notorious, Deadly and Hardened Bank robber from whom GMPGs, Rocket launchers and Several Rifles were recovered in 2015, He was released from Prison in December 2017. He was arrested on the 11th April, 2018 in Lagos. vi) Jimoh Isa 28yrs Native of Okene Kogi State indicted by Technical intelligence generated on the Bank Robbers. He was arrested on the 11thApril, 2018 in Lagos. 4. Three000 (3) suspects namely Azeez Salawudeen 20yrs, Adewale Popoola 22yrs and Adetoyese Muftau 23yrs from whom Two (2) phones and SIM cards belonging to victims were recovered have also made confessional statements admitting to the various roles they played in the commission of the crime. These three (3) suspects in whose possession another Beretta pistol and Fourteen (14) rounds of live ammunitions were recovered were arrested in connection with the Offa bank robbery. They have previously been investigated and charged to court for armed robbery and cultism. They have made confessional statements admitting to the various criminal roles they played in the recent bank robbery in Offa. 6. All the suspects during investigation confessed to the various criminal roles they played in the commission of the crime, however, investigation is being intensified to arrest other suspects still at large and bring them to justice. 7. The Nigeria Police Force once again deeply commiserates with the Government and People of Kwara State, most especially the people of Offa and the families of the victims. The Force will leave no stone unturned in unravelling this dastard act and bring all those responsible to justice. The Force appreciates the supports from members of the public so far and calls for calm and their cooperation to sustain the normalcy that has been restored in the State.